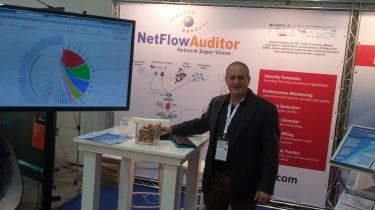 Last week we presented NetFlow Auditor at CyberTech 2016 in Tel Aviv, Israel. Cybertech is the most significant conference and exhibition of cyber technologies outside of the United States. Israel is building a name for itself as the global center of cybersecurity and we have a unique network intelligence solution that fits the Israeli cybersecurity vision. NetFlow Auditor’s unique approach to delivering granular Network Security Forensics, Intelligent Behavior Anomaly Detection and Diagnostics and End-Point Threat Detection was appreciated by the “who’s who” of the Israeli Cyber community that intimately understand the need for granular network intelligence and threat mitigation. The candidness, openness and warmth of the Israeli community has to be experienced and I cannot begin to express my gratitude for all the intelligencia and warm wishes from those who visited our stand. IdeaData already enhances Check Point firewalls with NetFlow Auditor providing a joint solution with Check Point providing ultimate network anomaly analytics and forensics (https://www.checkpoint.com/downloads/sb-checkpoint-netflow.pdf). 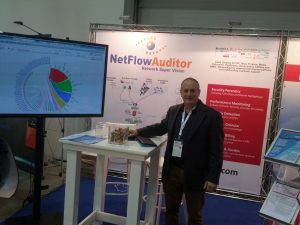 We look forward to NetFlow Auditor becoming a valuable part of the Israeli Cybersecurity space and contributing to its defense. IdeaData has been building innovative network analytics solutions for the Enterprise and ISP/Telco marketplace since 1995. At the World Congress of IT in 2002 we won multiple awards for Security and Business Intelligence for our DigiToll software and we continue to deliver and extend our superior network forensics and detection technology. Our objectives are to keep creating tools that build a safer Internet with unique methods to identify and mitigate undesirable traffic. IdeaData’s NetFlow Auditor is a premier flow-analytics solution providing extreme visibility eliminating network blindspots. Anomaly detection and end-point threat intelligence coupled with unique granularity for high-compliance meta-data retention and security forensics help organizations reduce risks associated with inappropriate and malicious traffic and poor performance. Trusted globally by the largest companies for its scalability and flexible analytics. Perpetual diagnostics enable fast mitigation from DDoS, insider threats, botnets, illicit transfers and other bad actors.